Buckeye Fire manufactures a line of portable and wheeled fire extinguishers, one of which is the Carbon Dioxide fire extinguishers that are designed to fight class B, and C fires using Carbon Dioxide as the extinguishing agent. Carbon Dioxide fire extinguishant are commonly found where electrical or flammable fires may occur such as in gas stations, auto repair shops, bars, industrial kitchens, warehouses, powerplants, aircraft service areas, etc. The unique thing about the carbon dioxide fire extinguisher is that it is a clean agent extinguisher – this means that it can be used on fires involving sensitive electrical equipment. The Carbon Dioxide will not corrode, clog up or otherwise damage the electrical equipment. This section lists the product’s name, identifies Buckeye’s contact information, and provides a phone number to call in case of an emergency. This section explains how to identify the Carbon Dioxide Fire Extinguishant and provides key biological hazard statements regarding its use, including the main warning “liquefied gas under pressure”. In addition, multiple precautionary statements pertaining to product storage, use, contact or consumption of the Carbon Dioxide Fire Extinguishant agent, the agent container, immediate first aid interventions if consumed, inhaled or exposed to skin. The Liquidfied gas (Carbon Dioxide) is considered hazardous by the OSHA Hazard Communication Standard 29 CFR 1910.1200. Carbon Dioxide fire extinguisher needs to be stored away from direct sunlight and in a well-ventilated area. This section lists chemical composition and specific weight percentages of the various ingredients of the Buckeye Carbon Dioxide, along with the CAS number for each ingredient. This section explains how to treat an individual who has fallen or passed out due to the carbon dioxide from the fire extinguisher. Rescuers who find a victim who has fallen or passed out due to excessive inhaling of the carbon dioxide should remove the victim from the area and to fresh air as quickly as possible. Trained first responders should administer supplemental oxygen or preform CPR as needed. It also identifies the medical condition, frost bite, that is aggravated by exposure to the Carbon Dioxide Fire Extinguishant as well as the consequence of chronic overexposure to the agent. This section reviews the firefighting capability and potential chemical reactions to the Buckeye Carbon Dioxide Fire Extinguishant agent’s decomposition in fire as well as explosion hazards when the fire extinguisher is exposed directly to the fire. This section describes what to do in a situation where the Carbon Dioxide Fire Extinguishant agent has been released accidentally, how to clean it up, and includes a warning for use of PPE in dealing with the clean up until the oxygen level in the immediate area is at least 19.5%. This section identifies the need for use of personal protective equipment when handling the fire extinguisher to limit exposure while it’s not in use, proper storage of chemical, and general inspection for integrity of container. This section presents the regulatory exposure guidelines, explains the respiratory hazards of exhaust gases and incomplete combustion that exist during the use of the Carbon Dioxide extinguisher, and the recommended respiratory, eye, and skin protective measures and equipment to limit exposure. This section identifies the physical and chemical properties of the Carbon Dioxide Fire Extinguishant agent including appearance and odor. This section lists the degree of stability, the byproducts of decomposition, and any hazardous reactions of Carbon Dioxide agent including the Ecotoxicity and Dissipation of the carbon dioxide. This section presents the known exposure effects of Carbon Dioxide Fire Extinguishant to humans as a direct result of inhalation, ranging from 1%-100% carbon dioxide. This section also describes other hazards that may occur if the carbon dioxide from the fire extinguisher comes in contact with the skin, indigestion, eye contact, general exposure and repeated over exposure. This section identifies any effects that agent has on ecosystem toxicity, its environmental degradability, bioaccumulation, and potential of soil mobility for contact with groundwater. This section identifies Carbon Dioxide agent disposal considerations and the potential differences between federal regulations and state or local regulations. This section identifies that the Carbon Dioxide Fire Extinguishant agent IS idefined as a hazardous material in the US or Canada, but that when transported in a stored pressure fire extinguisher the extinguisher itself is considered a hazardous material with shipping requirements listed including shipping name, and identification number. This section identifies the ingredient’s international inventory status by country and agency, and the federal and specific state regulatory information of the Carbon Dioxide agent. This section declares “other information” that may be pertinent related to the specific product, including but not limited to, regulatory information for other countries as well as any qualifying statements. 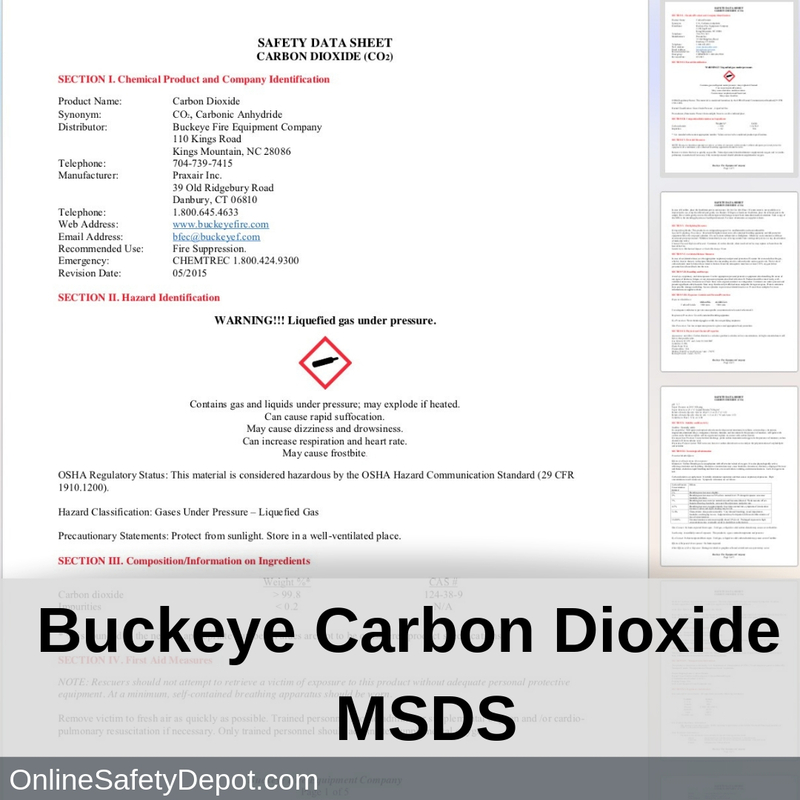 Buckeye’s Material Safety Data Sheet (MSDS) for Carbon Dioxide fire extinguishers.